As the culmination of the Digital Harrisburg Class, we, as students, were asked to put together a final project to demonstrate both the digital skills and the knowledge of Harrisburg we had gained through the class. In my case, I followed the early trail of the rather compelling and successful mayor and reformer Vance C. McCormick, local man who used his business, political, and charitable connections in the city of Harrisburg to become mayor, in order to oversee some of the most critical years of the City Beautiful movement. ults published by the papers that he under performed as compared to the candidates and initiatives that he ran alongside. With this in mind, I explored the census data to find any indication why. For the most part, it was inconclusive at first. Without more data, it was hard to identify the correlating factors between who voted/didn’t vote for Vance McCormick. The demographics of the city at this time seemed relatively consistent across the board. The only significant varying factor seemed to be race. He performed well in areas with fewer black residents, and poorer in areas with more. Moving off of this, however, it became apparent that the deciding factor seemed to be closer to class than to race. 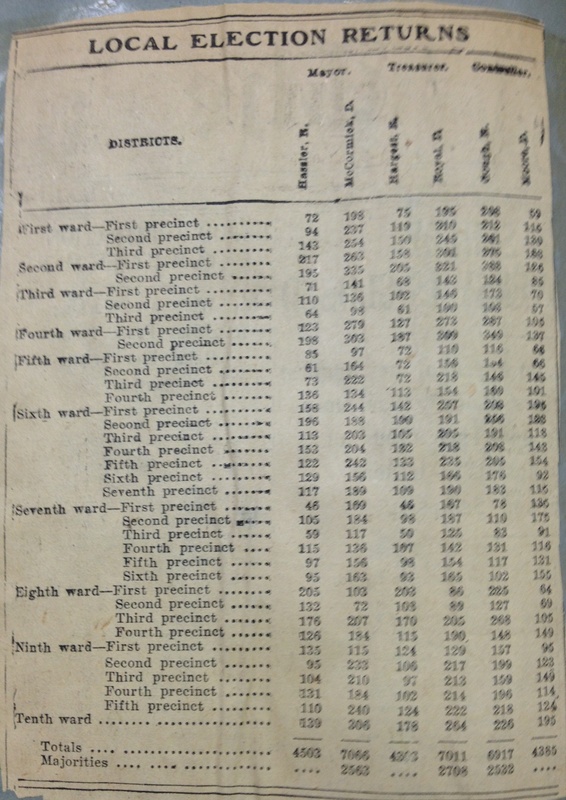 When his returns are cross referenced with the maps of 1900, it becomes apparent that much of his success came from the wards along the riverfront, generally from the precincts containing the upper class Front Street areas. Following from this, it made sense that he would perform more poorly in areas with high African-American populations, as, not only were there less upper class whites in those areas, but he was, after all, a Democrat in the early 1900’s, which hardly makes him a compelling figure to any African-Americans who may have voted. This, combined with his background in the elite reformer circles of the city, were all strong indicators of his support being based not in the broad, populist leader sense, but as an extension of the popularity of the reform campaign. In completing this project, however, there is some sense of culmination to the class itself. Combining the major aspects and tools covered by the practical side of the class, it also opens up a discussion for a reflection of sorts on the class. As a student not entirely sure of my own future, the class has been a way to expand my horizons and widen my experience with different historical practices. This, I believe, is one of the most significant values of Digital History, even if only in a practical sense. In a modern work environment, perhaps the greatest argument for Liberal Arts majors is the versatility they bring to the table. A liberal arts student looking for a job should display versatility not only in their manner of thinking, but in their skills and abilities. There is no better example of this versatility than digital history. A student with experience in digital history can display a greater level of capability and a more extensive understanding of technology. In a world where technology becomes both more widespread and more crucial, history students with a digital history experience in their tool belt are not only able to present themselves better to prospective employers, but are then able to perform the jobs better than they otherwise could. What’s more, there are the basic improvements digital history offers over some traditional methods. Searchable digital databases, are, at the very least, a significant improvement upon a traditional archive, a digitization allows for preservation at a significantly lower cost. On an essential level, however, the benefit offered by digital history is simply progress. Whether through success or failure, attempting new things is how an institution or a school of thought or practice grows. If an aspect of digital history is a success, then it has added something meaningful to the discipline. If another aspect should fail, then it has at least provided a new outlook on a problem, and more often than not, there are important things to be learned from a failure. The progress of any field should always be kept in mind, and experimenting in digital history is one of the best ways to do this.